Presenting a diamond ring as a sign of engagement only became common practice in recent history. However, giving a ring of some kind as a symbol of love and betrothal dates back thousands of years. It seems timeless that the term ‘engagement’ has been associated with a ring. It is widely believed that the Ancient Egyptians were the first to use rings as a symbol for matrimony. They believed the complete circle represented eternity, and a couple would exchange rings made out of woven reeds. 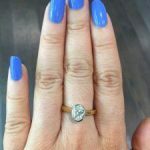 They would wear these rings on their left hand, on the finger between the middle finger and the little finger, which would eventually be known as the ring finger because of this practice. They chose this finger because it was believed that in this finger there was a vein that ran directly to the heart. This vein has been named “vena amoris” which in Latin literally means “vein of love”. There have also been historians that believe the Ancient Greeks had traditions of exchanging rings before marriage. But the first proof we really have of “engagement rings” is from the Romans. Originally, however, engagement rings weren’t given for the romantic reasons we exchange them today. An engagement ring was used to show ownership over the woman, similar to a dowry or bride price. The man would typically present the woman with two rings: one made of gold, which she would wear in public, and one made of iron, which would be worn at home while doing household chores. Throughout Roman history, the use of both gold and iron rings has had many different meanings, and hasn’t exclusively symbolized engagement or matrimony. Another type of engagement ring that was popular in Roman times was a gold fede ring, which shows two hands and sometimes two hearts joining together. This trend was brought to Medieval England when Rome conquered over the Anglo Saxons. During the Middle Ages, marriage and engagement were taken very seriously, as the engagement was as binding as the marriage. The betrothed couple would appear in front of a priest to make their solemn promises and exchange rings. During the Middle Ages, posy rings and fede rings were very popular choices for engagement rings. In this period, the ‘banns of marriage’ were also implemented, firstly by the Catholic church, meaning that all marriages must be made public knowledge to ensure that there were no objections or lawful reasons why a couple should not be wed. This made it even more appealing for a man to show that his betrothed was no longer available for courtship, as there would be a waiting period (roughly 40 days) before the couple would be allowed to marry. Grooms were also obligated to pay a ‘deposit’ at the engagement ceremony; if he then tried to back out of the agreement he would have to pay a penalty that was equal to four times the betrothal price. It was the King of the Romans, Maximillian I, who was the first known giver of a diamond engagement ring. It was presented to Mary of Burgundy in 1477. The setting of the ring was in the shape of an M, decorated with very flat pieces of diamond. During this period, it would have been completely unheard of to present a diamond ring to signify an engagement. In the 16th and 17th centuries, the gimmal ring was a very popular choice as an engagement ring. Gimmal rings are made from two or three loops that are put together to create the complete ring. The engaged couple would wear one part of the ring each and then rejoin them at the wedding ceremony and use them as a wedding ring. With three part rings, a third person could witness the couple’s engagement vows and hold the third part of the ring until the marriage. Posey rings, which are engraved with small poems, were also a popular choice during this period, and were often given as engagement rings with love poems engraved on the inside. On occasion, some couples would exchange silver rings to mark an engagement, to be replaced by a gold ring upon the wedding. The Victorian period is known to be one that was full of traditions relating to love, as Queen Victoria was besotted with her husband Prince Albert. 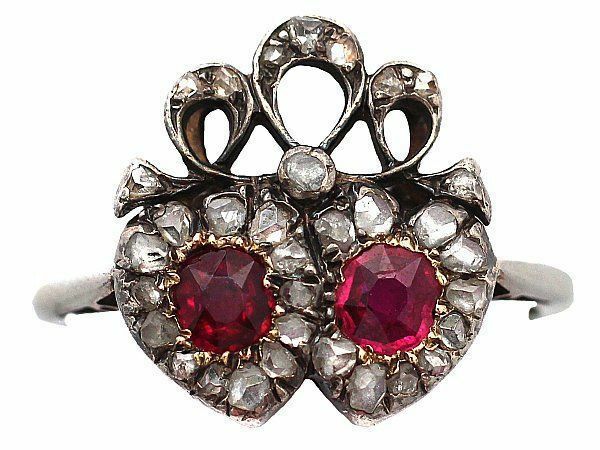 Victorian engagement rings were mostly full of symbolism and often featured romantic and sometimes whimsical motifs. These included hearts, bows, flowers and sometimes even snakes, which symbolised eternity, even Queen Victoria’s engagement ring featured two snakes. 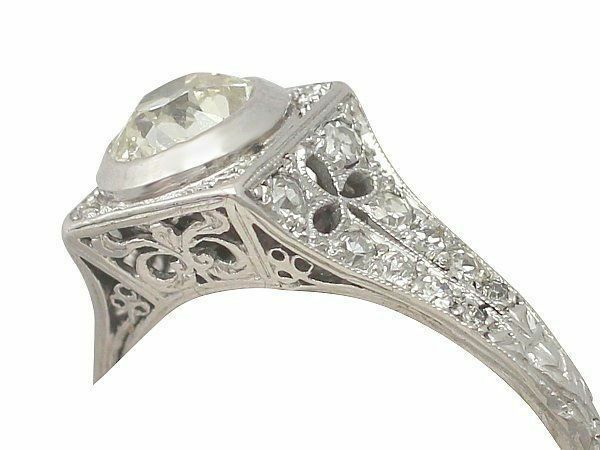 Victorian rings tended to be very decorative and often included details such as floral carvings or lacy scrolls in the setting and shank. As well as scalloped edges and rose gold settings. After Prince Albert’s death, the Queen and the country respectively went into a period of mourning. During this time, a lot of black onyx, engraved gold, and enamel can be found on jewellery, including engagement rings. Diamonds also began to increase in popularity at the end of the Victorian era. This was due to the fact that a large diamond deposit was discovered in South Africa. Diamond cutting techniques still weren’t perfected as they are today . However, the Old European Cuts of this period have a certain appeal, as each is completely unique. Tiffany & Co. also introduced the six-prong “Tiffany Setting” which raised the diamond above the shank to help maximize its brilliance. This technique is now used on almost all rings featuring diamonds. It was during the Edwardian times, at the beginning of the 20th Century, that men presenting engagement rings became a social custom that was followed by all. During this period, the rings tended to be ornate. Following from the Victorian styles, there were many delicate floral designs and many incorporated filigree decoration. 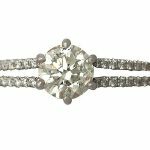 As we move through the 20th Century, the popular styles for the periods had a big influence on the styles of engagement rings, such as the Art deco period. During the First World War, platinum was very scarce, therefore using gold instead was more popular. During this period, engagement rings tended to be quite simple, sometimes featuring a small diamond, but often with a gemstone instead. It was in 1947 that De Beers Diamond Company used the advertising slogan ‘a diamond is forever’ which caused the popularity of diamonds in engagement rings to soar. More than 80 years later, diamonds are still seen today as the standard for engagement rings. 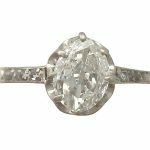 Through the 20th Century, trends constantly changed; different styles such as solitaires, trilogies, and eternity rings came and went in popularity. Different metals also became more and less popular through the decades. In the 1950s, platinum and white gold sales outweighed yellow gold. Even the shape of the cut of stones changed in popularity, at one point being Asscher cuts, to modern brilliant cuts, to radiant cut stones. 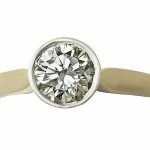 Since the beginning of the 21st century, trends have continued to evolve, with many people choosing a fairly minimalist style, and more gemstones becoming popular again. On the other hand, some couples prefer to look into antique rings, with old cut diamonds that have more character and history behind them. Whichever style of engagement ring you are looking for, we can’t wait to help you find it. Thanks for sharing the whole history. The best of all I think is the 20th Century – 21st Century, but evolution has been phenomenal.